Researchers evaluated the effectiveness and safety of statin treatment in 214 children with familial hypercholesterolemia (FH). The children, 8- to 18-years-old, continued to receive statins and were evaluated after 10 years. Researchers reported that at age 30, coronary heart disease survival was 100 percent in the group of young adults who received statins from childhood and 93 percent in the affected parents. NOTE: ALL TIMES ARE CENTRAL. ALL TIPS ARE EMBARGOED UNTIL THE TIME OF PRESENTATION OR 3 P.M. CT/4 P.M. ET EACH DAY, WHICHEVER COMES FIRST. For more information Nov. 16-20, call the AHA News Media Staff Office in the Dallas Convention Center at (214) 853-8008. Before or after these dates, call the Communications Office in Dallas at (214) 706-1173. For public inquiries, call (800) AHA-USA1 (242-8721). As we mark the tenth anniversary of the publication of the Diabetes Control and Complications Trial and the fifth anniversary of the United Kingdom Prospective Diabetes Study, studies which so clearly demonstrate the role of glycemic control in the prevention and delay of microvascular complications, it is interesting to consider what fundamental new concepts in diabetes care have developed. Since the 1970s, there have been substantial epidemiological data demonstrating that cardiovascular diseases (here defined as ischemic heart disease, stroke, and peripheral vascular disease) consitute the primary cause of morbidity and mortality in patients with diabetes. In fact, at least 60% and arguably 80% of people with diabetes will eventually succumb to cardiovascular disease (CVD). 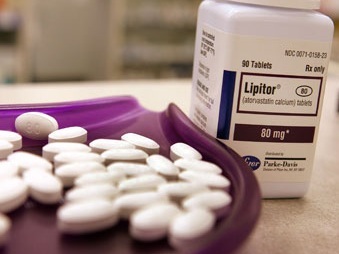 High cholesterol" align="right" /> However, because patients with diabetes were largely excluded from randomized clinical trials that evaluated the role of cardiovascular risk factor intervention to reduce CVD, the evidence that cardiovascular events and death can be prevented or delayed in patients with diabetes by antiplatelet treatment, blood pressure reduction, and lipid-lowering therapy has been slow in developing. Aspirin therapy was demonstrated to reduce CVD events in the Early Treatment Diabetic Retinopathy Study (ETDRS), with a publication in 1992. The most recent issue of Clinical Diabetes largely focused on hypertension therapy, stimulated by the publication of the ALLHAT study, a clinical trial that randomized more than 12,000 patients with diabetes, arguably more hypertensive patients with diabetes than had been studied in all previous trials evaluating the role of blood pressure treatments in reducing CVD. In this article, we focus on lipid-lowering therapy, more specifically on the hydroxymethylglutaryl-CoA (HMG-CoA) reductase inhibitors or “statins,” stimulated by the publication of the Heart Protection Study (HPS). The HPS was a statin trial that randomized almost 6,000 people with diabetes, almost an order of magnitude more people with diabetes than had been reported in CVD outcome trials of lipid-lowering therapy through 2002.